Mouse anti Human Anti-Remicade(Infliximab) 103A8.03. 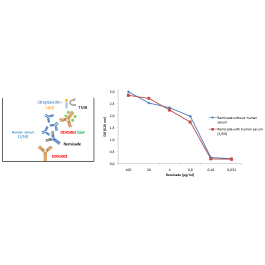 Detection antibody for Remicade detection. Remicade® (Infliximab) is a chimeric monoclonal antibody targeting TNF - alpha, used for the treatment of autoimmune diseases such as rheumatoid arthritis, ankylosis spondylitis, Crohn’s disease, psoriatic arthritis or ulcerative colitis. We have generated a panel of anti - Remicade® (anti - Infliximab) monoclonal murine antibodies. These antibod ies can be used to develop and calibrate Remicade (Infliximab) and anti - Remicade (anti - Infliximab) detection assays. - 20°C. KEEP CONTENTS STERILE: no preservative.Glycerol protects from freezing. Remicade® (Infliximab), negative for rituximab (mabthera) and roactemra (tocilizumab).